The ZAGG Pocket wireless Bluetooth® keyboard for smartphones and small tablets is the easiest, on-the-go solution to smartphone typing. Delivering over 85% the size of a desktop keyboard, the Pocket maintains fast, natural typing, and then folds into a compact, protective case that easily fits into pockets and purses. And, unlike other folding keyboards, the Pocket folds between lines of keys to preserve comfortable key spacing so you can get more done, naturally. The Pocket folds into a convenient 9” X 2.5” X .5” rectangle that’s thin enough to go everywhere. Just slide it into a pocket or purse and go knowing the most portable solution to mobile typing is ready when you are. PORTABLE PRODUCTIVITY The ZAGG Pocket wireless Bluetooth® keyboard for smartphones and small tablets is the easiest, on-the-go solution to smartphone typing. Delivering over 85% the size of a desktop keyboard, the Pocket maintains fast, natural typing, and then folds into a compact, protective case that easily fits into pockets and purses. And, unlike other folding keyboards, the Pocket folds between lines of keys to preserve comfortable key spacing so you can get more done, naturally. Type Naturally Unlike other folding keyboards that space keys awkwardly, the Pocket folds between rows of keys to maintain the spacing you’re used to. Plus, the Pocket maintains over 85% the typing space of a traditional keyboard Go Anywhere The Pocket folds into a convenient 9” X 2.5” X .5” rectangle that’s thin enough to go everywhere. 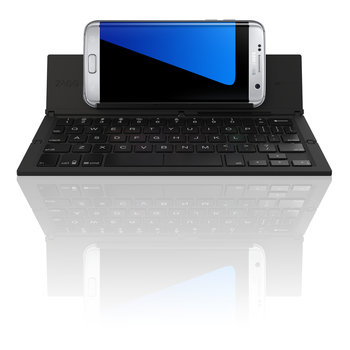 Just slide it into a pocket or purse and go knowing the most portable solution to mobile typing is ready when you are.